They have no shortage of workers, what they lack is experienced soldiers and a way out of the stalemate. Humanity doesn't have any experience soldiers to offer, they're a fledgling space-faring species with no real experience in large scale space-based warfare, whereas the loroi are a huge empire with a huge and experienced stellar navy. I doubt humanity could offer enough of what would be cannon-fodder, lets be honest, to tip the scales in any meaningful way. Just re-read Kikitik-25's speech, and noticed he actuall announced that a Gatecrasher attack is imminent, and his task in Naam was binding the forces. Seems Kikitik-27 may have been off by a minor amount of days, but still. Also puts the question on me whether the Umiak have started similar Gatecrasher attacks at other points along the frontline. I think that you meant insignificant industrial capacity, the difference in size and tech level between Humanity and the Umiak/Loroi is like comparing a small WW1 era nation to modern China and the USA. I meant industrial capacity by volume of production, not tech level. As in Humanity produces Y billion tonnes of 'stuff' every month and the Loroi produce Y*X billion tonnes. What 'significant' means I don't know but I'd guess somewhere between 5% and 20%, but probably on the low end. Of course, I may be remembering something that doesn't exist anyway. The Loroi have several fully industrialized planets. The Union much more than that. The war effort surely requires much more than one ship to be taken into service EVERY SINGLE MONTH. I cannot fathom humanity as described in outsider to be able to produce much more than 1 or 2 ships every year, when the will is tehre to pay for them. I assume the spaceship output alone (tonnage of space ships) of one of the Loroi union planets will surpass all of Humanity production when measured in tonnes. And that already excludes the agriculture and industrial output of those planets to sustain an economy able to produce war ships for space. Humanity will be procutionwise <<<<1% of Loroi output, let alone Union output. I fear all of Humanity produces less than 1% of Loroi-colonised Maia. But I don't think we will get stats on that anyway. Don't know about that production capacity, Krulle. The TCA/Scout corps alone had roughly 200 ships constructed for them in roughly half a century, and that number doesn't include civilian/private ships necessary for interstellar trade -and transportation needs. I wouldn't be surprised if Humanity's civilian fleet well exceeded a thousand ships. After all, we're talking about the needs of roughly 200 million people living off-Earth, in what should be conditions that exceed the standard of living of the inhabitants of South-Korea and Japan combined (probably the most technically advanced societies on Earth today). I do wonder how much of the Tinza Sector Fleet is engaged at Sala 128 though. It depends on whether the whole Sector Fleet participates in the incursion at that star, or if for this enemy force the Farseers were unable to provide reliable data too like in Naam, meaning the Loroi Sector Commander might not have committed her whole battle fleet yet. In any case, we're talking about 30 known Umiak divisions in this assault alone, divided over 5 fleets. I kinda doubt the Tellai -and Tinza Sector Fleet alone would be able to defeat that many divisions head on. It's kind of hard to guesstimate the overall tonnage of the Loroi Navy, but Alex himself said on Page 074, that while SG51 was "small and under-strength", it's 28 ships were more than the entire Terran Colonial Fleet and Scout Corps combined. This and what Arioch said somewhere that each new Terran starship hull built gets the next in line ECS- registry number assigned, leads me to think that there are less than 200 starships in total belonging to the TCA, military and commercial, minus the ones having been lost as their registry numbers don't get reassigned. I'd say that a normal Loroi Navy Strike Group has at least 30 ships. Depending on how many such groups are currently active and how large the sector fleets are, I would carefully put the strength of the entire Loroi Navy somewhere in the high hundreds to low thousands of vessels. Also we need to remember that in the failure of the Semoset offensive a couple of years ago the Loroi Navy lost most (?) of their assets including most of their high tonnage capital ships and were able to at least somewhat recover, so the Union's production capacity can't even be compared to the Terran one. I'd also very much like to know what happens in Sala-128 and Sala-101. As to how much of the Tinza fleet is engaged - my first thought is "all of it" because the Umiak got the jump on them. The Insider page on Terran warships specifically states they're the vessels built for the TCA. As far as I understand it this excludes vessels constructed for/by other entities within Human space. Besides, the TCA only came into existence because the ships of entities were made ready for armed conflict. Also note that appearantly the oldest dedicated military ships of the Colonial Fleet, the Centaur class of light cruisers, are still used extensively. When both sides [Aldean colonies and the Martian colonies under the lead of Yinghuo] began arming their transports, escalation seemed inevitable, and the TCA charter was amended to allow for the formation of the Terran Colonial Fleet. Under the terms of the agreement, the Aldean Self-Defense Force surrendered its armed ships to the new Colonial Fleet, and all of the Aldean colonies (including the Yinghuo proxies) agreed to form a global federated government, which is a full member of the TCA and persists to the present as the only planetwide government in Human space. Strikegroup 20 at Sala 101 reporting 3/4 divisions incoming from Peze 1 (possibly Kikitik-27 following from Naam). In the Leido system initially 8 divisions from Rallis splitting into groups, And 3 additional “groups” (Gota Relay later mentions 2 divisions) deep jumping into the system. Then followed by the 6 Khalka divisions, also from Rallis. According to Beryl 8 divisions equals approximately 600 vessels, that’s about 75 per division. As far as we currently know a fleet of at least 2025 is involved in this entire action, of which 1275 (63%) are in the Leido system. ...leads me to think that there are less than 200 starships in total belonging to the TCA, military and commercial, minus the ones having been lost as their registry numbers don't get reassigned. The http://well-of-souls.com/outsider/fleet_terran.html page lists 58 active (ex Freeman) TCA ships, not including McCracken classe. Additionally, the TCA fleet was built without any external threats (although probably with an eye towards the potential) and has been built basically to keep the colonies at arms length from each other when necessary. So this fleet construction speed was mostly in peacetime. In WW2 the USA produced three Liberty Ships a day (peak production, 18 shipyards) taking ~42 days per ship, plus military ships, aircraft, tanks an all the other assorted paraphenalia that come with going to war, so Humanity can certainly increase ship production rates several times over. In a modern context the Emma Maersk Triple-E class container ship takes about three months to build (which blows my mind). Building a ship in zero-g is probably a lot harder than doing so in a drydock, however, although we do have artifical gravity, so maybe that could be scaled up if deemed necessary. Our ships will continue to be significantly inferior to Loroi Union ships unless they decide that having an isolated shipyard in a location completely unknown to the Umiak is valuable enough to start giving us access to some of their technology (shields would be a nice start). In retrospect this entire line of discussion should have been in the 'misc Human' thread. Sorry. The ECS hull numbers are assigned to TCA units; they do not include civilian or local patrol or police ships (except those specifically provided by the TCA). The Tinza Sector Fleet based at Azimol has a strength of about 5 divisions, the majority of which are at Sala 128. The Tinza reserves at Nezel have a strength of about 4 divisions, but due to the Code Four alert, some of these will be moving toward Sala 128 (if they are not already). The joint Seren-Tinza front shares a combined raider force of about 3 divisions (9 groups), but due to action prior, only two groups (SG51 and SG20) are currently in position to participate. A typical Umiak division consists of 15 squadrons of 5 (75, 15-20 of which are "heavies"), plus 25-50 gunboats. A typical Loroi division consists of 3 groups of 4 squadrons of 8 (96, of which 16-24 are "heavies"), plus a variable number of interceptors. In both cases, in scout or raider type divisions most "heavies" will be cruisers or battlecruisers, and in fighting-line divisions, more of the "heavies" will be battleships. Ah, I got the jump there somewhat. The TCA's responsabilities were amended, not installed, with the Aldean Crisis. Might be a nice question for Arioch if (some of) the ships numbered ECS 1 through 19 are the former Aldean Self-Defense ships. Those deep jumping divisions divided themself to cover 3 targets. Comm chatter above Lashret Stillstorm on page 130 mentions them as an additional 6. Hence the 2 extra divisions Gora Relay mentions in its communication with Highland-7. I think the whole force the Umiak pushed through the Rallis jump zone is part of the "Khalkha Divisions", not just those last 6 divisions. That's more battle divisions in a frontline sector fleet then I thought there would be. Would there be more reserve divisions further "down" the sector, for instance in Laget or something? In any case I reckon the Maiad -and Seren Sector Fleets might have more strength since they seem to attrack more of the Umiak assaults, with the Sector Fleets in the sectors without a frontline having less divisions overall. That means there are about 2.000 umiak ships in the sector facing approximately 1.000 loroi ships. That seems quite lackluster for a major, war deciding offensive by a race that outnumbers the Loroi anyway. So either there are major reserves still hidden or there is something fishy going on with this offensive. Or the k/d ratio of SG51 is even more impressive than we had realised. Or the whole rest of the front is under a similar attack, thereby denying the Loroi to send the deeper reserve fleets anywhere specific, as they won't know where the breakthrough will be, and also denying them shifting the fleets along the border. Usually I'd agree but this is their surprise attack after counteracting farseeing. The first wave should be their breakthrough to use surprise. Having a localised 2-1 advantage as an attacker is disappointing. Perhabs they hope to make up for it by gaining an advantage thanks to poor Loroi intel. The ~20 division gatecrasher force has bypassed the front line and is en route to attack the reserve base defended by -- at best -- 4 divisions. Isn't it basically "game over" for an inhabited planet if even a few Umiak ships get within striking distance? They'll start hitting major population centres and cause catastrophic damage to infrastructure and loss of life, not to mention ecological damage. I don't know how keen the Loroi are on civil defence, but planets will always be soft targets. Maybe the Umiak are doing this as a kind of "kamikaze" attack designed to punch through the front lines and cause havoc in the interior; even if the Loroi eventually push them back or surround and destroy them, the damage and loss of civilian life will cripple the Loroi Union. Remember, the Umiak are not seeking to conquer and exploit the Loroi; they want to wipe them out. Considering the Umiaks suicidal tactics I can really see a Umiak ship out of resources for a continued campaign to simply crash their ship into a target. They would in function be a small asteroid damage wise, a city hit by one at high speed would be HURT! A ship out of resources is usually a soft target itself for any fixed defenses near such a target. If I am calculating it correctly (and given that I don't know the dry weight of Umiak vessels), then if Loroi "Nazali"-class destroyer (dry weight 75 kt) hit a planet at 0.1 c (30,000 km/s), its kinetic energy would correspond to about 8,066 teratons TNT, or about 300 dinosaur-killer asteroid impacts. In other words, more than enough to totally annihilate the planetary biosphere. The good news is that Deinar III has experience with and countermeasures against hypervelocity impacts. Now that we know the Umiak are bringing their resupply in close proximity to their main fleet, I wonder if their deep jump/main fleet deployment model is meant to keep their main fleet and supplies in reserve until they reach their main target. Edit: triple checked my math. My calculations show that the energy released in a 75 kiloton object hitting at .1c would be about 3.4x10^22 joules, or about 8.13 teratons of tnt. The Chicxulub Crater/Dinosaur Killer asteroid had about a 120 Teraton explosion, according to my sources. 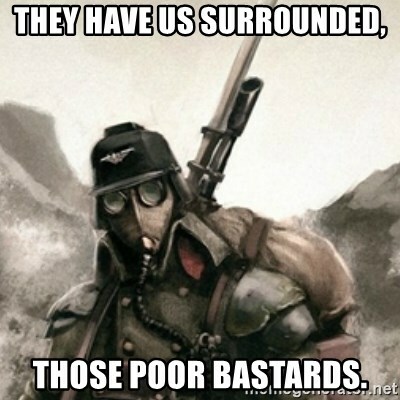 Anyone on here familiar with the Death Korps of Krieg from a Warhammer 40,000 will appreciate the parallel. In any case, a considerable energy capable of causing massive damage to the planet and its ecology, infrastructure and population.